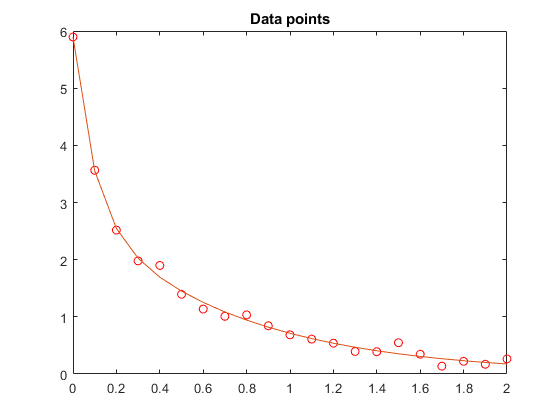 This example shows how to fit a nonlinear function to data using several Optimization Toolbox™ algorithms. Let's plot these data points. The lsqcurvefit function solves this type of problem easily. We run the solver and plot the resulting fit. To solve the problem using fminunc, we set the objective function as the sum of squares of the residuals. Notice that fminunc found the same solution as lsqcurvefit, but took many more function evaluations to do so. The parameters for fminunc are in the opposite order as those for lsqcurvefit; the larger lam is lam(2), not lam(1). This is not surprising, the order of variables is arbitrary. There were 30 iterations using fminunc, and 6 using lsqcurvefit. There were 185 function evaluations using fminunc, and 35 using lsqcurvefit. Notice that the fitting problem is linear in the parameters c(1) and c(2). This means for any values of lam(1) and lam(2), we can use the backslash operator to find the values of c(1) and c(2) that solve the least-squares problem. We now rework the problem as a two-dimensional problem, searching for the best values of lam(1) and lam(2). The values of c(1) and c(2) are calculated at each step using the backslash operator as described above. %FITVECTOR  Used by DATDEMO to return value of fitting function. %   (defined below), at the data points xdata with parameters set to lam. %   with n linear parameters c, and n nonlinear parameters lam. %   where the j-th column of A is exp(-lam(j)*xdata) (xdata is a vector). %   where ydata is the observed values of y. There were 33 function evaluations using the 2-d formulation, and 35 using the 4-d formulation. 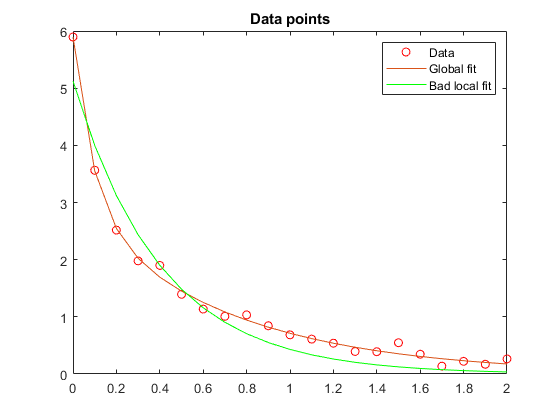 Choosing a bad starting point for the original four-parameter problem leads to a local solution that is not global. Choosing a starting point with the same bad lam(1) and lam(2) values for the split two-parameter problem leads to the global solution. To show this we re-run the original problem with a start point that leads to a relatively bad local solution, and compare the resulting fit with the global solution. 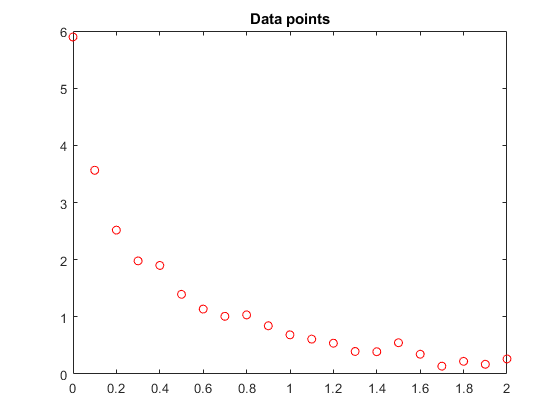 The residual norm at the good ending point is 0.147723, and the residual norm at the bad ending point is 2.217300.